To foster innovation and its environment, key levels of management and individuals must be committed to creating an environment and culture that promotes creativity, be engaged and promote the ability to promote change in nimble, agile and flexible ways to meet changing conditions in the market place and with customers. It is this creativity through the innovations that are flowing through the organization that often needs a critical focal point to create a change that has impact. The job within any change initiative is to give stimuli in the actions, transactions and interactions in the pursuit of innovation. These come from changing practices but focusing on the critical interaction between people and the situations that delivering innovation demands. Altering an organizations workplace environment comes from focusing on the person’s creativity and the organizations climate conditions to deliver on its innovation need. From what I gather, there are over 40 different assessments you can use for creativity and innovation. Within the best known, most cited and researched two still stand out for me as tested and valuable. These have stood the test of time and I believe provide a great place to start assessing your climate and what motivates a more creative / innovative environment. The first is the Climate for Creativity (KEYS) developed by Terisa Amabile and the other one is the Creative Climate questionnaire developed by Gören Ekvall. Both came out in the late nineties but seem to have stood that ‘famous’ test of time. I have shown in Ekvall’s model a modified version introducing the split between the attitude for work and its five part make-up and work atmospheres five parts. I’m going to focus more on Ekvall’s model as it is the one I have used more and it ‘feels’ more comfortable for me. Amabile’s model contained 17 factors, whereas Ekvall’s model has only ten factors. There have been a number of comparative studies on these two. One argument being that less factors allows for a more open aspect but less controversial. To be honest I like them both as they each have slightly different ways to look at creativity. Firstly though, let me outline Amabile’s model. It comprises three key elements: resources, management practices and organizational motivation. Each of these elements interacts with one another and has an impact on the resulting level of innovation. In Amabile’s structure the assessment breaks answers down into two criteria of measuring current performance and seeking perceived importance and attributed 100 points per section to gauge relative importance using a simple Likert-type scale with anchor phrases at each extreme. 5) Team Selection – Personality. Ekvall’s model was divided into two halves, each comprising five factors. This also allowed Ekvall’s model to be split over two pages, with the first entitled ‘atmosphere for work’, and the second entitled ‘attitude to work.’ Maybe this is why I like it for this defining split for deepening the conversation. Again to use this you attribute 100 points per section to gauge relative importance using a simple Likert-type scale with anchor phrases at each extreme. 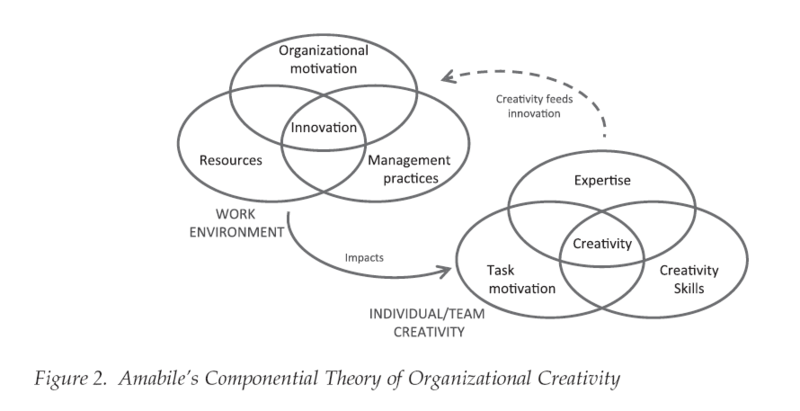 Organizational Climate for Creativity and Innovation (1996) is the article that sums up all of Ekvall’s research within organizational climate and creativity throughout the second half of the 20th Century. 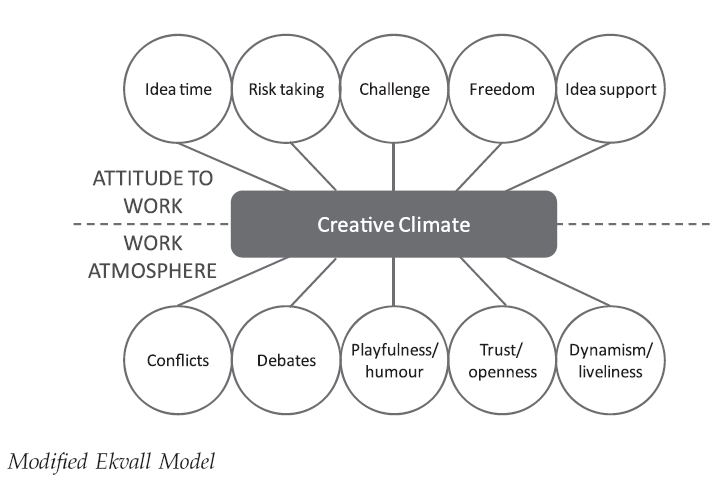 This was where Ekvall formalized his ten dimensions of creative climate (challenge, freedom, idea support, trust / openness, dynamism / liveliness, playfulness / humor, debates, conflicts, risk-taking, and idea time) as well as described the implications of the Creative Climate Questionnaire (CCQ). The ten dimension factors from Ekvall’s creative climate questionnaire. Idea Time: amount of time people can use (and do use) for elaborating new ideas. In the high idea-time situation, possibilities exist to discuss and test suggestions not included in the task assignment. There are opportunities to take the time to explore and develop new ideas. Flexible timelines permit people to explore new avenues and alternatives. In the reverse case, every minute is booked and specified. The time pressure makes thinking outside the instructions and planned routines impossible. Risk-Taking: tolerance of uncertainty and ambiguity in the workplace. In the high risk-taking case, bold initiatives can be taken even when the outcomes are unknown. People feel as though they can “take a gamble” on their ideas. People will often “go out on a limb” to put an idea forward. In a risk-avoiding climate there is a cautious, hesitant mentality. People try to be on the “safe side” and often “sleep on the matter.” They set up committees and they cover themselves in many ways. Challenge and Involvement: degree to which people are involved in daily operations, long-term goals, and visions. When there is a high degree of challenge and involvement people feel motivated and committed to making contributions. The climate is dynamic, electric, and inspiring. People find joy and meaningfulness in their work. In the opposite situation, people are not engaged and feelings of alienation and apathy are present. Individuals lack interest in their work and interpersonal interactions are dull and listless. Freedom: independence in behavior exerted by the people in the organization. In a climate with much freedom, people are given the autonomy and resources to define much of their work. They exercise discretion in their day-to-day activities. Individuals are provided the opportunity and take the initiative to acquire and share information about their work. In the opposite climate people work within strict guidelines and roles. They carry out their work in prescribed ways with little room to redefine their tasks. Idea Time Support: ways new ideas are treated. In the supportive climate, ideas and suggestions are received in an attentive and professional way by bosses, peers, and subordinates. People listen to each other and encourage initiatives. Possibilities for trying out new ideas are created. The atmosphere is constructive and positive when considering new ideas. When idea support is low, the automatic “no” is prevailing. Fault-finding and obstacle-raising are the usual styles of responding to ideas. Conflict: presence of personal and emotional tensions in the organization. When the level of conflict is high, groups and individuals dislike and may even hate each other. The climate can be characterized by “interpersonal warfare.” Plots, traps, power and territory struggles are usual elements of organizational life. Personal differences yield gossip and slander. In the opposite case, people behave in a more mature manner; they have psychological insight and control of impulses. People accept and deal effectively with diversity. Debate: occurrence of encounters and disagreements between viewpoints, ideas, and differing experiences and knowledge. In the debating organization many voices are heard and people are keen on putting forward their ideas for consideration and review. People can often be seen discussing opposing opinions and sharing a diversity of perspectives. Where debate is missing, people follow authoritarian patterns without questioning them. Playfulness/Humor: spontaneity and ease displayed within the workplace. A professional, yet relaxed atmosphere where good-natured jokes and laughter occur often is indicative of this dimension. People can be seen having fun at work. The climate is seen as easy-going and light-hearted. The opposite climate is characterized by gravity and seriousness. The atmosphere is stiff, gloomy and cumbrous. Jokes and laughter are regarded as improper and intolerable. Trust/Openness: emotional safety in relationships. When there is a high degree of trust, individuals can be genuinely open and frank with one another. People count on each other for professional and personal support. People have a sincere respect for one another and give credit where credit is due. Where trust is missing, people are suspicious of each other, and therefore, they closely guard themselves, their plans, and their ideas. In these situations people find it extremely difficult to openly communicate with each other. Dynamism / Liveliness: The eventfulness of life in the organization. In the highly dynamic situation, new things are happening all the time and new ways of thinking about and handling issues often occur. The atmosphere is lively and full of positive energy. There is a kind of psychological turbulence that is described by people in those organizations as “full speed”, “go,” “breakneck,” “maelstrom,” “and the like. People get caught up in the excitement and energy. The opposite situation could be compared to a slow jog-trot with no surprises. There are no new projects; no different plans. Everything goes its usual way. Over the years the Ekvall questionnaire has been collected and bench marked. The value of seeing a significant part of an organization of 7,000 take this test and then be compared against others completing the CCQ can be valuable. 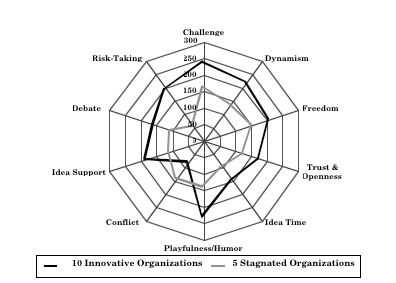 Taking one example between a group designated as innovation organizations against those regarded as stagnating would deliver a spider web visual showing the difference and where the gaps are to focus upon. The discussion from producing such a view can become very telling. Of course this is a snapshot but it can become a powerful enabler to change. Improving the climate, over time changes the culture and conditions for how an organization views innovation. Perceptions need to be broken down, clarity on a pathway forward, navigated and negotiated with a leadership that is providing a consistent and determined support, so that the climate and conditions are constantly improving the environment for innovation – the culture learns to adapt and recognize this as the everyday ‘way of working’. There are many variables that influence people’s perception of the working environment and by focusing on understanding the climate and the possible potential to change this, in what it can provide as the prime contributor for providing a huge impact within your innovation environment. This entry was posted in Polymers and tagged change implications for innovation, cultural orientation, culural differences, innovation audit, innovation change process, innovation relies on culture, nature of culture and innovation, the environment for innovation, thinking about innovation change. Bookmark the permalink. ← Changing the workplace environment for innovation?